I am sure that most people have heard the story f the ugly duckling. How a chick that looks different then all the other duck chicks grows up to become a beautiful swan. Well there are some species of birds that go through a similar metamorphosis each year. 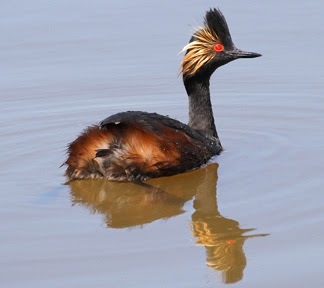 Take the eared grebe for example. The subject of both of these photos are eared grebes. Other then the red eye they do not look the same and I bet that if you spotted the two of them right next to each other that most people would think that they were two different species. Of course spotting these two next to each other would be highly unlikely. The top photo is the eared grebe in its winter plumage. This photo was taken in California in February. Eared grebes migrate to the Pacific Coast, southwestern United States, and Mexico. The second photo is an eared grebe in its breeding plumage. I guess that it is hard to find a mate when you are in black and white. This photo was taken in Montana in May. 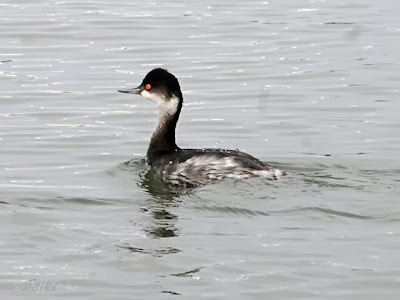 Eared grebes breed on inland lakes in the western half of the U. S. and Canada. Beautiful shots! Thanks for the education on eared grebes. You're right... I don't believe I would have realized they were the same species of bird if I saw them side by side. Great shots. 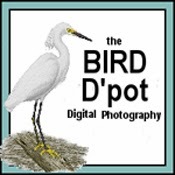 Wow....pretty photos...it looks so dapper in the 'puffed up' plumage! Love the eye color too, don't you? The difference between baby and adult colouring is incredible. And both are so cute. HI Jeff Many thanks for the information and great shots about the Grebe. That is a fascinating looking bird, what a headdress! Nice photos and informative comments!